Good evening ladies and gentlemen. Friends of regional parks. Welcome to the Auckland Regional Council – for the second to last time. Tonight’s celebration is more than just the launch of a very special book. It is also something of a Rite of Passage – an opportunity for us to look back and acknowledge the people, the events and the outstanding vision that has shaped the history of the Auckland regional parks network – and this organisation especially over the last 47 years. But of course as the book will reveal the roots of our parks system go back deeper than that. Among us tonight are some very special guests and I would like to acknowledge Judge Arnold Turner, founding Chairman of Regional Parks and dedicated parks advocate and guardian; Jim Holdaway a founding member of the ARA, and someone we can describe as the father of conservation in Auckland and also a chairman of Regional Parks; the former long-serving General Manager of Regional Parks Phil Jew and our most senior ranger Jim Forbes. All outstanding public servants for Auckland. I also welcome other ARC Councillors Michael Barnett, Bill Burrill, Paul Walbran, Christine Rose, Judith Bassett, Jan Sinclair, Joel Cayford, Dianne Glenn, Brent Morrissey. And while extending warm congratulations to our new Mayor Len Brown I welcome representatives of the new Auckland Council, Christine Fletcher, George Wood, and Cathy Casey. Also part of the new wave are members of the Waitemata Local Board Shale Chambers, Pippa Coomb and Trish Reade. In regard to this wonderful book ‘Dreamers of the Day’, together with Cr Sandra Coney and Cr Judith Bassett (both published historians), I was privileged to be a member of a working group that met regularly with the author Graeme Murdoch and administrator Rob Mouldey and watched this book come together and take shape. I wish to take this opportunity to thank my fellow members of the working group. As Chair of the ARC Parks and Heritage Committee since 2004, Sandra Coney has brought a deep-seated passion for the regional parks to this project and I congratulate her on all the outstanding achievements within the realm of regional parks during her two terms. Our colleague Cr Judith Bassett’s wealth of knowledge and experience, as an academic and trained historian, guided us and provided a valued critical eye to the editorial direction of the manuscript. To the author and long term colleague historian Graeme Murdoch, I offer my thanks for the magical way you have recorded the story and captured the essence of Auckland Regional Government’s greatest achievement. A magnificent writer, Graeme has crafted this book with an expertise, a familiarity and warmth and understanding very few other authors could possess. This remarkable book has been a long time coming. It is appropriate that the book has been produced now, at a time of historical change – with the Auckland Regional Council (ARC) about to be disbanded, and replaced from 1 November 2010 by a new Auckland Council – the Super City. As the last chairman of the ARC I am very proud of its legacy of achievements, and of those of its predecessor, the Auckland Regional Authority (ARA) over 47 years of outstanding public service to the people of the Auckland region. I take particular pride in what many consider Auckland’s ‘jewel in the crown’, the ARC’s regional parks network, owned on behalf of the people of the region in perpetuity and freely accessible to all. These 27 sister regional parks, with their beautiful lyrical names, cover more than 40,000 ha of forested ranges, natural areas, farmlands, and 180 km of outstanding coastline and beaches. Apart from providing landscape protection as Auckland’s greenbelt, and providing wonderful opportunities for outdoors recreation, the regional parks also have an additional role as important sanctuaries for much of the region’s remaining mainland biodiversity – native birds, lizards, invertebrates and plants. Auckland’s regional parks network was first envisaged by visionary planners and regional politicians like FWO Jones and Dove Meyer Robinson in the 1950s and early 60s. In the post-war period these visionary Aucklanders being aware that the nearest national parks lay some 400km from Auckland, were anxious to provide outdoors recreation outlets for Auckland’s growing population and to protect Auckland’s outstanding natural landscapes and coastlines from the threat of subdivision and suburban sprawl. It has been a race against time to save these areas from development for present and future generations. A race, which has sometimes flagged – because of inevitable political vagaries – but one which thankfully can still claim many proud successes. And as we face the future – we can say – that race is not yet run. It has been my great personal joy as an elected public servant to have been so intimately associated with the expansion and development of our regional parks since 1992. When I came here we had 18 regional parks – now we have 27. Moreover it has been a privilege to have known and to have worked alongside visionary Aucklanders like Arnold Turner, Jim Holdaway, the late Alan Brewster, Phil Jew, Professor John Morton, and others in this process. This book records the vision, deeds and leadership of these great Aucklanders and many others – including the parks rangers – who together have helped build and shape our parks over many years. Among them are the ‘dreamers of the day’ as Graeme Murdoch has called them. Colin McCahon once entitled one of his famous NZ paintings one of the ‘Northland Panels’ ‘A landscape with too few lovers’. McCahon’s reproach to his fellow New Zealanders, cannot I suggest be applied to the gallant ‘dreamers of the day’ – who sought to protect Auckland’s beautiful landscapes with a dedication and ardour close to romantic love. This book will enable readers to learn of the deeds of these ‘dreamers’, and more about little-known but important aspects of the political history of post-war Auckland. Readers will also learn about natural Auckland – Auckland’s wild and secret places – and the fight to save them for future generations. We hope and we believe that this book will inspire readers to visit Auckland’s regional parks, their regional parks, more often. For Auckland’s regional parks are widely recognised as one of the great achievements of New Zealand local government – and quite distinctively Auckland. A part of Auckland’s way of life – and our quality of life. It is hoped therefore that this book, written at this time of great change for Auckland will provide inspiration and direction for those who are charged with the stewardship of Auckland’s regional parks network on into the future. but this book also embodies years dedicated labour, the inspiration and the dreams of the many, many people who helped build Auckland’s regional parks network. On this note I am reminded very much of the words of the German socialist playwright Berthold Brecht. 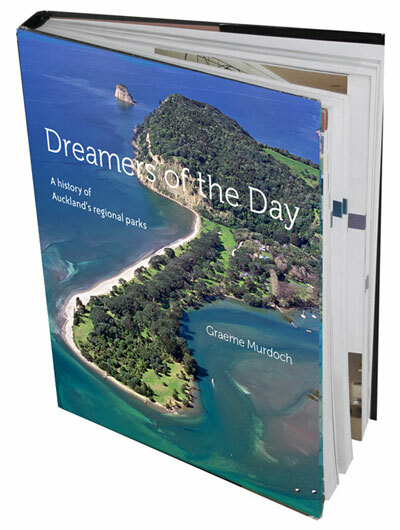 Therefore it is with great pride that on behalf of the Auckland Regional Council I offer up this book ‘Dreamers of the Day’ to the people of the Auckland region and to posterity.